Shalloch on Minnoch (NX 405 907) is the highest hill in Ayrshire and is the focal point of some fine moorland and hill birding for those fit and energetic enough to explore the tops. From Straiton, take the hill road south towards Newton Stewart. This road is part of the South Ayrshire National Byway cycling network and connects with National Cycle Route 7 and the Galloway Forest ride from Loch Doon to Barr. The walking in these hills can be heavy going through long tufted grass with boggy areas, especially at lower levels. It is generally very wet underfoot in the mild climate. Above about 600 metres, however, the terrain becomes drier and more pleasant and the views magnificent. Forest plantations can make access verging on the impossible, which must be taken into account when choosing a route up. The longest but driest route, some 5km as the crow flies and 400 metres up, is from the car park and picnic site (NX 97 958) by the River Stinchar. This is 11.5 km from Straiton at an altitude of 80 metres. 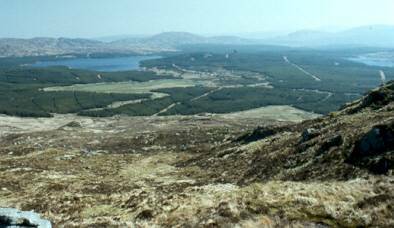 Follow the Newton Stewart Road until beyond the plantation and then climb south by Cairnadloch at 467 metres, Caerloch Dhu at 659 metres and across a dip to Shalloch on Minnoch at 769 metres. A ridge can be followed further south to Tarfessock at 696 metres. Alternatively, but wetter, start from the layby at the summit of the pass (NX 81 937) at an altitude of 430 metres and climb by Shalloch at 542 metres to Caerloch Dhu and thence to Shalloch on Minnoch. 7.2 km beyond Stinchar Bridge, and over the pass, the road meets another hill road (National Cycle Route 7) at Rowantree Toll (NX 53 907). From the car park and picnic site there, views of the Merrick and other Galloway Hills can be had and the surrounding moors, forests and hills scanned. Nearby, a forest track leads SW to the former Shalloch on Minnoch Farm, following the Water of Minnoch and Shalloch Burn. The path to the hills beyond the farm has been absorbed into a plantation, is virtually impenetrable and is not recommended. The 2km of track, however, can be rewarding birding. Off-road tracks unsuitable for wheelchair users. Among the species to be expected on a trip to this wild area are Buzzard, Merlin, Red Grouse, Black Grouse, Golden Plover, Curlew, Grey Wagtail, Tree Pipit, Dipper, Spotted Flycatcher, Wheatear, Raven and Crossbill . The terrain is right for Golden Eagle . Though birding while hill walking in this magnificent area is rewarding for the energetic, many of the species may be sighted from the road or on easy strolls from the car parks. The memorial monument at the third car park (NX 53 907) is to David Bell, a cyclist of some repute who for thirty years contributed to a local newspaper under the pen name of The Highway Man. His articles told of the cycling trips he made all over south-west Scotland. He died in 1965 at the age of 58 years. Details of his life are on the memorial. This is an appropriate stop for modern day cyclists before climbing north over the pass. This entry was posted in Locations - South Ayrshire on 01-Jul-2003 .